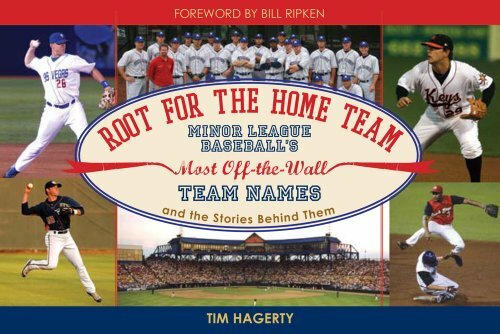 Over the years, there have been many teams among the leagues of Minor League Baseball to feature unique names, sometimes perhaps even bordering on the bizarre. Team names generally refer to something traditionally affiliated with the region that it's based in and are often chosen by a popular vote among the public or in a contest. Here are a few of the interesting names that have taken the field in modern times. Previously known as the Akron Aeros, the team changed its name following the 2013 season. The new name was inspired by the association of the rubber industry with Akron, Ohio. The second minor league team to be based in Batavia, New York, the team now called the Muckdogs went through three names prior to adopting 'Muckdogs' in 1998 following the results of a fan vote. Muck is a black soil that helped make the Batavia region a prime area for growing onions. The franchise had been located in Bristol, Connecticut and New Britain, Connecticut and been called the Red Sox and the Rock Cats. For the team's move to near-by Hartford for the 2016 season, a contest was held that called for submissions to suggest a new name. 'Yard goat' is a slang term for a type of locomotive meant for moving railroad cars at a railyard. This name was perhaps influenced by the historic Hartford Union Station. Originally based in Ottawa, Ontario, the franchise was called the Lynx. In 2008, the team began play in Allentown, Pennsylvania as the IronPigs. The name refers to pig iron, which can be used in the process of making steel, something that the region is famous for. Formerly known as the Reds, Colts and A's, the team became the Nuts for the 2005 season. The name was inspired by the Modesto area's history of nut farming. Again, it was chosen by a fan vote. The franchise was originally based in Orlando, Florida. There, it went through four different team names. Following the 2003 season, the team relocated to Montgomery, Alabama and became the Montgomery Biscuits. Chosen as the winning entry of a contest, the name was picked because of the traditional ties of the region with biscuits and for potential marketing opportunities. Founded in 1959, the franchise called six different states home and went through several name variations before beginning play in Pensacola, Florida in 2012. The new name was again a result of a contest, this time held among season ticket holders. Wahoos are a type of fish that can be found locally. The 'blue' portion refers to the fish and to other connections with Pensacola. The franchise played home games in various locations in Connecticut and also in Albany, New York and had several names before moving to Richmond, Virginia. In 2009, the year before the team began play in Richmond, a contest was held via the Richmond Times-Dispatch to pick a new name. The name was apparently inspired by an encounter that the winning entrant had with a flying squirrel while he was clearing brush. Arguably the most famous minor league team of all-time, the franchise now known as the Mud Hens has been playing in or near Toledo, Ohio since the 19th century when it was part of the Interstate League. The name has changed intermittently over the years, and its league affiliation would alter from time to time, but the Mud Hen identity has endured. Reportedly, the name originates from the fact that at one point the team played their home games at a park near marshland that was a popular spot for a breed of bird called American coots, nicknamed 'mud hens'. Bill Kauffman Dispatches from the Muckdog Gazette. New York, New York: Henry Holt and Company, 2003.